The D-Res 20 AW Pouch is a pouch designed for smaller digital cameras. All Weather Cover prohibits bad weather and dust from affecting your gear. Soft, brushed tricot lining provides outstanding protection for your system from scratches. 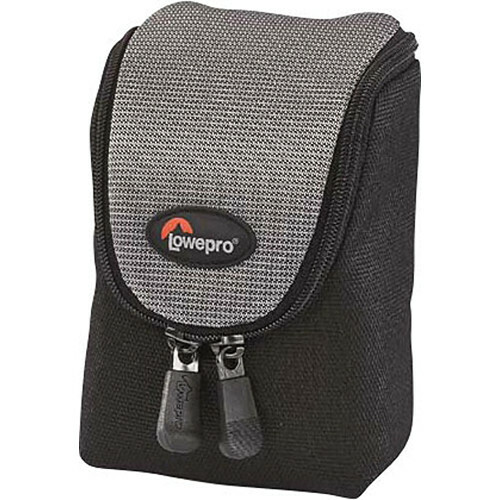 There are pockets for memory cards, four AA batteries and peripherals, plus a quick-release shoulder strap. An attachment tab fastens to your belt or any SlipLock base product i.e. Street & Field system. Box Dimensions (LxWxH) 9.8 x 4.5 x 3.9"
D-Res 20 AW Pouch is rated 4.3 out of 5 by 7. Rated 4 out of 5 by Da Bear from Pretty Nicely Thought Out Pouch Big opening really helps with larger point and shoots (I bought it for my P-7000). Battery compartment ok for small to medium point and shoot batteries - tight for my P-7000's battery. Attachment strap at back limited. I like to strap my camera to my Pack strap - which is vertical. The attachment on this pouch is limited to horizontal attachments (like to a belt) All weather cover a plus. Rated 3 out of 5 by PatrickM from not large enough This bag is well built and has nice padding for protection. Also supposed to be water resistant, which is a nice feature. My problem is I bought a backup lithium ion rechargeable battery, and there isn't sufficient room for the battery to fit in the bag. I am able to stuff it in but then I have a difficult time removing the camera. I got this bag to go with the Nikon P7100. It would probably be fine for a smaller camera that used AA batteries. Rated 5 out of 5 by Anonymous from Perfect Pouch for Rough Field Use The pouch is perfect for the particular camera we purchased. The pouch is rugged on the outside and padded on the inside allowing the camera to bounce around safely in a pick-up truck (passenger seat, not bed) on dirt and gravel roads in four seasons. We'll have a much better idea of how the pouches hold up after a season of use. Rated 3 out of 5 by Ren, Chilean Photographer from Not the best choice for Coolpix P7100 I bought this pouch together with the P7100, but I think it is a little small for the camera. I had some problems trying to fit the camera strap into the pouch- Normally I use this brand and <I find generally the products are good and well designed. I would not recommernd specifically this pouch for this camera. Rated 5 out of 5 by Davey from 20 AW is AOK for Canon G7 and G15 I have used the 20 AW for I believe over 5 years. I got it for my Canon G7. It's showing its grime age but is physically intack like the day it was new. It has protected my cameras from falls from refrigerator heights without consequence...great padding. A rain bonnette pulls out of its bottom to cover the whole pouch! Nice swag. The belt clip is deployed without removing your belt! It is a very securing velcro wrap( Double Velcro ). The interior cloth comforts the camera without sticking to it. Cameras slide in and out easily. On the left inside is a pocket for whatever. It's deep and will hold a SD card and in the case of the G15 an extra battery without crunching the camera or feeling like it will fall out. There is an inside front pocket for CF card but it is too loose to secure the card.I've doublebacked some tape to the CF card and all is well. I am now ordering another for my G15...it's that good!! Externally, the 20 AW feels rugged. It closes with dual zippers that can function independantly or both can be zipped to meet in the middle. A shoulder strap clips to rings on the back. Feels like the people who designed this use it! Rated 5 out of 5 by Juan from Perfect design Love this case. It is very roomy and it has different pockets that allow you to separate batteries, SD cards and camera.